Construction in the BeltlineRecent construction in the Beltline has seen immense growth in the downtown area. New condo buildings, major road infrastructure, and sidewalk improvements have all contributed to the rejuvenation of the Beltline area. Check back for more updates on recent and future projects occurring in the Beltline! 4th Street UnderpassThe completion of the 4th Street S.E. underpass has been met with great enthusiasm by all that travel to and from the Beltline. Completed last November, the four-lane underpass allows easier access to the city’s East Village and Victoria Park. The $70 million project connects Olympic way at 11 Avenue S.E. with 9th Avenue S.E. under the CP railroad tracks and the underpass is expected to cut down travel time from the Saddledome by 30- 40%. The pedestrian-friendly design features modernistic wind turbines, bright LED lighting and handrails to make travel by foot or bike more inviting. A team of urban planners, the Calgary Municipal Land Corporation, and the Urban Design group were among the main investors and developers of the project. Balboa Land Developments Inc. has begun construction on a second residential tower at the Keynote development. Located on the corner of 11th Avenue and 1st Street S.E., the 29-storey condo with 250 units will feature on-suite amenities such as: a wet-spa, rooftop gardens and stunning city views. Set to be completed in spring of 2013, units are on sale now and predicted to sell out quickly. Situated just minutes away from the Scotiabank Saddledome and Olympic Park, the Keynote development is a great place to live and work in an urban setting. Sunterra Market, Starbucks, and a RBC Branch located on the main level of the village provide essential amenities to residents. 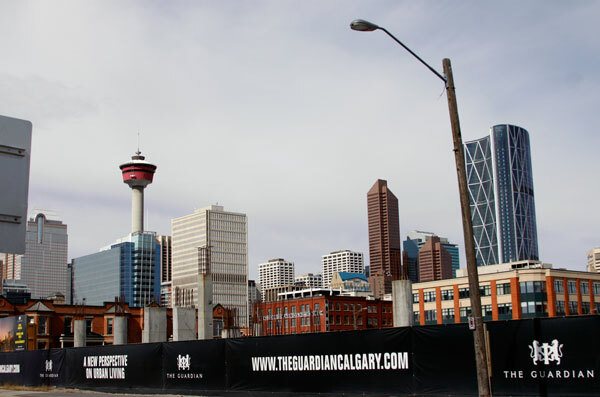 Set to be one of Calgary’s tallest residential buildings, the Guardian, has been stirring up a lot of excitement. Due to unfathomed interest, the Guardian started selling suites one month earlier than expected and several groups even camped outside overnight to ensure their spot at the coveted condominium. The 42-storey tower with 321 suites will be located on the corner of 11th Avenue S.E and 3rd Street S.E. near some historical Beltline sites. As of April 2012, 80% of the suites have been sold, only a month after going on sale. The building will feature one and two building suites, starting at $150,000 and $313,900 respectively. The project is still waiting on the city approval and ground will hopefully be broke this summer. Construction is scheduled to be completed in mid-2014. 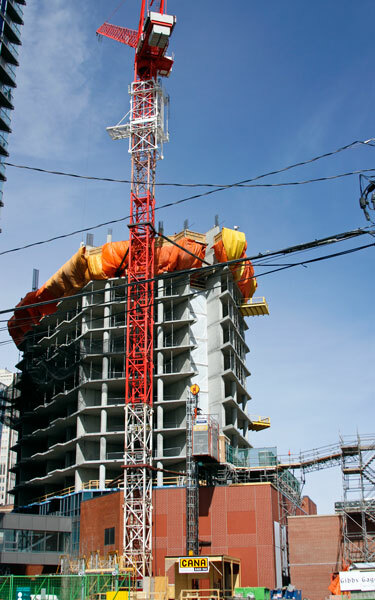 Located in the Connaught District across from the historic Lougheed House, the Calla 12-storey residential tower is anticipated to be completed in summer of 2013. Overlooking the Beaulieu Gardens, Calla will consist of 168 one-and-two bedroom homes, priced in the mid $200,000’s and $300,000’s. The building will also feature several townhomes and single-storey garden homes with a separate entry. The suites contemporary, garden feel add a sense of cottage charm to the Beltline and are among the most exciting new developments in the area. Sales of the suites are expected to quickly. Calla will also be equipped with a yoga and gym studio for all residents. This new addition to 14th Ave and 6th Street S.W. was developed by award-winning Vancouver based Qualex-Landmark Group and the project began in late 2011. The company’s projects also include Stella, Luna, and Nova. An 80,000 square-foot development is in the works for the corner of 17th Avenue S.W. and 8th Street S.W. The second floor will be devoted solely to the electronics superstore, Best Buy. Smaller shops and business will take residence in the ground level, and professional offices will make up the third and fourth floors. Hanson Square will feature over 180 stalls of underground parking, allowing shoppers ease of access to the building. Designed by BKDI Architects, the new building will add a modern twist to the otherwise historical landmarks along 17th Ave. With the exterior consisting of brick and large panels of glass, the new addition will add a lively edge to the street. Construction on Hanson Square began last summer.